Run, run as fast as you can. I’m a simple person who finds pleasure in the simple things in life. But of the many simple things I enjoy—watching the sun rise, listening to Beyoncé sing, stalking cat/dog videos online—watching racists get clocked is undefeated, and this week delivered in the most delightful of ways when it comes to Aaron Schlossberg, a midtown-Manhattan lawyer in New York City who was caught on video threatening to call U.S. immigration officials on Spanish speakers at a restaurant. Of course, it is unconscionable and outrageous that the Spanish-speakers had to be subjected to Schlossberg’s threats, but what happened after he was identified is nothing short of pure internet justice and fills my soul with such pure joy. However, possibly my new favorite thing is video footage of Schlossberg running away from reporters like the coward he is, tail between his legs, refusing to answer questions. What a far cry from the big, bold bigot who loudly interrupted diners’ lunches at a Fresh Kitchen eatery earlier this week to disparage people. “Your clients and your staff are speaking Spanish to staff when they should be speaking English,” Schlossberg was seen ranting in video footage that started circulating Tuesday afternoon. “My guess is they’re undocumented, so my next call is to ICE [U.S. Immigration and Customs Enforcement] to have each one of them taken out of my country. If they have the balls to come here and live off my money—I pay for their welfare. I pay for their ability to be here. “Every person I listen to—he spoke [Spanish], he spoke it, she’s speaking it—it’s America!” he added. Consider this a variation on a theme. 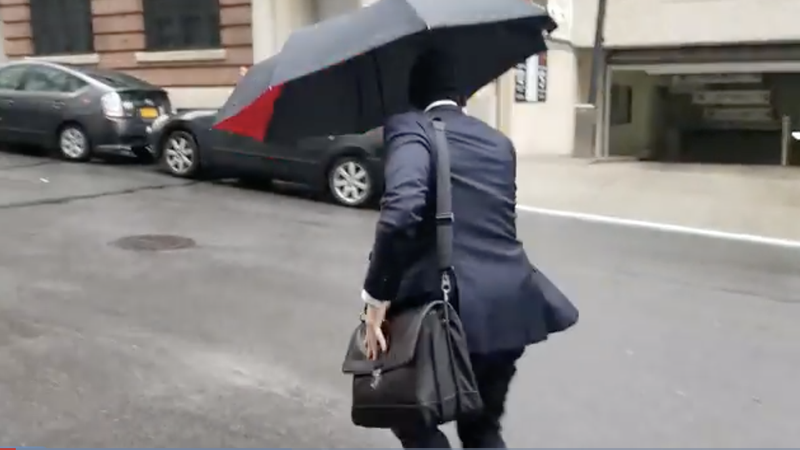 A different Schlossberg showed up Thursday as he attempted to hide behind his open umbrella before making a mad dash away from reporters at a speed that could make Usain Bolt proud. “Please send help,” Schlossberg was heard saying on his cellphone, according to the New York Post. “They’re claiming things that aren’t true … grabbing me, not letting me walk. “They won’t let me move. They’re surrounding me,” he added, before hopping into a yellow cab. It’s not nice to be targeted for simply existing, is it? Here’s another clip of Schlossberg running, yet again. This time from an NBC News reporter. Look at that, as graceful as a gazelle fleeing from a cheetah. Of course, this is not the first time (and probably won’t be the last) that Schlossberg’s racism has come back to bite him. Shortly after the original footage of him surfaced, a GoFundMe campaign was launched (and almost promptly reached its goal) for the sole purpose of sending mariachis and a taco truck to Schlossberg’s offices. And while it is arguable that the only type of taco Schlossberg deserves is a raisin-infused-potato-salad taco, the internet does have a certain swagger and eat-shitness that I adore. While reporters are trying to get Schlossberg to speak out as ardently and boldly as he did at Fresh Kitchen, New York lawmakers are calling for his disbarment. According to ABC News, U.S. Rep. Adriano Espaillat (D-N.Y.) and Bronx Borough President Ruben Diaz Jr. sent a formal complaint to the First Department of the New York State Unified Court System, a state committee that disciplines lawyers, asking that Schlossberg be stripped of his license. “We are sending this grievance to say that you cannot engage in xenophobia, bigotry, hate and get away with it. Such behavior should never be tolerated,” Espaillat said in a statement Thursday. Amid all the backlash, Schlossberg was also kicked out of his Madison Avenue workspace, because who really wants to be in cahoots with a racist? The New York Post notes that Schlossberg had been using a business center as an office address for his private law firm, but was unceremoniously booted out after the video surfaced.